Product information "ARRI LMB 4x5 Pro Set"
Suited for a wide range of applications in just one product, the robust but lightweight LMB 4x5 allows for an unprecedented level of flexibility. From a single-filter configuration for gimbals, drones, or Steadicams to clamp-on versions up to rod-mounted solutions, the LMB 4x5 makes short work of challenging situations. LMB 4x5 Pro Set - The LMB 4x5 set to fulfill all needs with the most modular matte box – from single stage, to three stage, to bottom and top lightweight mounted, to the full-blown version with swing-away tilt module, all carbon fiber flags (top and side) and both extra filter stages (rotatable and non-rotatable). The weight of the whole Set is 2272g. The LMB 4x5 Pro Set comes in a foam insert that fits perfectly into any kind of Peli Case 1560. Note: 19 mm and 15 mm studio rod adapters must be ordered separately. K2.0013447 LMB 4x5 Swing Away Tilt Module. The module offers a comfortable swing-away with extension for easier lens changes, as well as an integrated tilt module for 10° up and down adjustments to avoid unwanted reflections. K2.0007992 LMB 4x5 Set of Mattes anamorphic.This set of Mattes includes 5 anam. 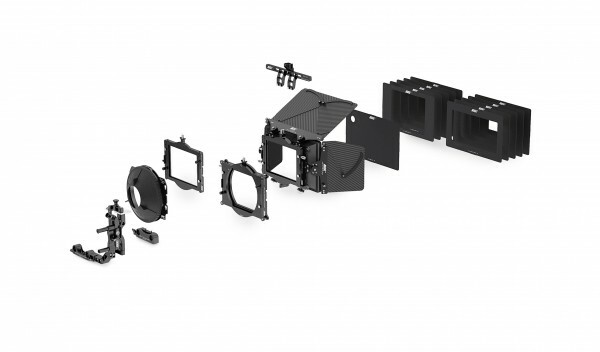 Mattes and fits to following Matte Boxes: LMB 4x5, LMB-5, LMB-15, LMB-25, MB-19. K2.0014006 LMB 4x5 Extra Non-Rotatable Filter Stage. An optional non-rotatable third filter stage for the LMB 4x5. Can be used as a stand-alone filter stage with all LMB 4x5 clamp adapters. The LMB 4x5 sunshade can be mounted directly to the front of the filter stage. K2.0013014 LMB Accessory Adapter. For 3/8 inch accessories such as ultrasonic devices-compatible with LMB 4x5 / LMB 6x6 / LMB-25 / LMB-6 with the additional sliding possibility for a perfect positioning. K2.0013460 LMB 4x5 Extra Rotatable Filter Stage. An optional 360° rotatable third filter stage for the LMB 4x5, with integrated tray catcher. Can be used as a stand-alone filter stage with all LMB 4x5 clamp adapters. K2.0014206 LMB 4x5 Tilt and Flex Adapter. A flexible rubber donut adapter to use with lenses from small to large diameters (62-143mm), for use with LMB 4x5 swing-away tilt module or with lenses where lens elements are extending. The LMB 4x5 15 mm LWS console can be mounted either on top or at the bottom. Compatible with LMB-25, LMB-5, LMB-15. K2.0013724 LMB 4x5 Top/Bottom Flag. A carbon fiber flag, with two extensions,which can be mounted at the top or the bottom of the LMB 4x5 – compatible with LMB-5, LMB-15, and LMB-25. K2.0000069 LMB 4x5 Set of Mattes spherical. This set of Mattes includes 5 Mattes and fits to following Matte Boxes: LMB 4x5, LMB-5, LMB-15, LMB-25, MB-19. K2.0013750 LMB 4x5 Side Flags. A set of two carbon fiber side flags, each extendable on the top. K2.0013427 LMB 4x5 15mm Lightweight Support Console. A screw-in standard 15 mm lightweight support console. Compatible with: LMB 4x5 143 mm clamp adapter LMB 4x5 Tilt and Flex Adapter. Related links to "ARRI LMB 4x5 Pro Set"
Customer evaluation for "ARRI LMB 4x5 Pro Set"